The 5043 Compressor/Limiter Duo is a new and powerful approach to dynamic processing! This new addition to the Portico range is designed with both tracking and mixing applications in mind. The Portico 5043 embodies two independent Compressor-Limiters (Channels A and B) housed within a half rack, 1U module. They can be used independently or connected in sequence to provide two separate control slopes. When used independently, for example, as a stereo pair, linking the D.C. control circuits via a front panel Push-Button, enables the level of each unit, “A” and “B”, to be held in a constant relationship. Rear panel TRS connections are provided to link multiple 5043s. This linking may also be extended to the former AMEK CIB and DMCL units. Any number of Portico modules that are equipped with the “TO BUSS” button may be sent to the BUSS input of the 5043 which makes it the ideal choice to form the core of a simple and cost-effective Portico mixing system. The Line input, when selected, provides a dedicated, transformer-balanced 10K impedance bridging input so that the 5043 may be inserted or included in any appropriate part of the signal chain at Console line-up level. In order to control gain, a V.C.A. or Voltage Controlled Amplifier (or Attenuator) is used. There are many types of V.C. including the use of tubes, discrete and integrated solid state circuits and naturally non-linear devices, each one having its characteristic behavior that reflects sonically on the final performance, and gives it a character or signature that can be musically attractive or not! The Portico 5043 makes use of a very accurate, low noise, low distortion V.C.A. having, essentially, no signature of its own. A part of the audio signal is rectified and smoothed to produce a suitable control voltage for the V.C.A. which has to respond very quickly and have low distortion. If the response is too fast, low frequency signals will themselves, be gain controlled! If the response is too slow, the signal will overshoot and the first few cycles will not get compressed. The speed and accuracy of the response, known as the “attack”, and the time frame that gain remains under the initial control, known as “release” or “recovery” and plays a large part in the way a compressor sounds. All Portico modules use input and output transformers and, almost entirely discrete component amplifiers. In fact the Line amplifiers on their own, inserted into the signal chain, are capable of enhancing the sonic quality of many signal sources, especially those of digital origin. These are some of the factors that enable, the Portico 5043, to work so unobtrusively within the context of a very high quality audio chain. Feed Forward or Feed Back? The Portico 5043 provides a choice of feed-forward or feed-back compression modes. The FB Button allows the user to switch between the two modes. If the V.C.A. Control voltage is taken from the 5043 input, (i.e. before the V.C.A.) the V.C.A. knows right away that a gain change is required and there is almost immediate response. This is known, logically, as a “Feed-Forward” compressor. If the V.C.A. Control voltage is taken from the 5043 output, (i.e. after the V.C.A.) it cannot act immediately on the V.C.A. because it has already been modified by settings of the V.C.A. and circuits through which it has passed. This is known as a “Feed-Back” compressor. The two compression characteristics are quite different; there is more “Overshoot” and both the attack and recovery ramps are changed, providing the user with powerful choices. Almost all of Neve’s earlier designs were “Feed-Back”. They were more musical and sweeter than with “Feed-Forward” designs; however the “Feed-Forward” design provides greater accuracy. Above a given “THRESHOLD” signals are reduced by an adjustable amount ranging from 1:1, (which is linear, or no reduction at all), to more than 40:1 which is a very high ratio, equivalent to that of a Limiter. RATIO is sometimes referred to as “Slope” because when depicted on a graph, the slope of the graph representing Output versus Input, is what changes. Ratio and Threshold are closely inter-dependent. If a RATIO as high as 40:1 has been set, then if the THRESHOLD is set at 0 dBu, even when a massive signal of +40 dBu (unlikely!) is presented to the input, the output signal will only be +1 dBu. RATIOS as high as this would normally be set somewhere above 0 dBu – say at +14 dBu, in order to prevent the output signal level exceeding just over +14 dBu to protect, for example, a digital recorder. Similarly, if a RATIO of 5:1 has been set, an input signal which is 10dB above THRESHOLD will only rise by 2dB above that THRESHOLD at the output. The ATTACK time is the time taken for the compression circuits to start compressing. A long ATTACK time allows short duration peaks to “escape” and go through uncompressed. This may cause overload on subsequent digital circuits. A very short attack time sounds un-natural and robs the signal of “life” by removing transients. Some transients are extremely fast and have little effect on the sound quality. Setting a long attack time often means that almost no gain reduction occurs because the transient is history (!) before compression has had time to operate. However, even the fastest circuits take time to operate which means that there is always some “Overshoot”. Small amounts of “Overshoot” are musically desirable – there are exceptions, of course. Setting the right values of RELEASE and ATTACK is what compression is all about! 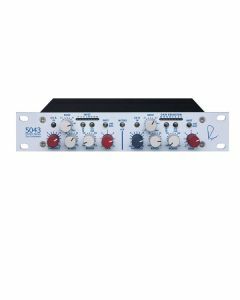 Once the principles are understood a Compressor-Limiter such as the 5043 provides a powerful tool that actually appears to enhance the dynamic range of a recording and so provide greater musical enjoyment. For signals below the "threshold" level that has been set, a compressor provides a linear path allowing signals to be amplified without the gain being adjusted in any way. When signals exceed the "threshold" level, the gain is reduced in a controlled manner that depends on the Ratio that has been set. Range from 20 mS to 75 mS. Range of RELEASE time is 100 mS to 2.5 Seconds. When the LINK Push-Button is engaged on both channels and the two channels, A and B, set to approximately the same values, GAIN control on both channels will be the same to preserve Stereo balance, levels normally being controlled by the channel with the higher signal level. Cascading the two independent sections of the Portico 5043 Compressor- Limiter provides extremely powerful and comprehensive control of Dynamic Range. When the LINK Push-Button is engaged, the signal passing through, channel A, may be used to control the amplitude of channel B. For example, the level of music through channel A can be controlled by speech on channel B, i.e. reducing the music level to make a "speech-over" announcement. Gain Range: Continuously variable from 6 dB to +20 dB. Threshold Range: Continuously variable from 36 dB to +22 dB. Ratio Range: Continuously variable from 1.1:1 to Limit (40:1). Release Range: Continuously variable from 100mS to 2.5 Seconds. FF/FB: Feed-Forward or Feed-Back VCA control. S/C or LINK: Multiple 5043′s may be daisy-chained via the rear panel jacks. When an individual channel is engaged, it’s control voltage appears at the rear panel LINK jack. When both channels are engaged they are linked together internally and their control voltage also appears at the rear panel LINK jack. LINE or BUSS input select: Selects rear XLR input or Buss Input jacks to accept Portico series buss outputs. Balanced and Floating Transformer Output: +25 dBu. Total Harmonic Distortion and Noise: @ 1kHz, +20 dBu output level, no load. Main Output, compressor bypassed: Better than 0.0006%. Noise: Measured at Main Output, un-weighted, 22Hz-22kHz, Terminated 40 Ohms. With Gain at Unity, Compressor disengaged: Better than “103 dBu. @ 18 Hz, “3 dB. @ 150 kHz 3 dB. Measured Channel to Channel: Better than 80 dB @ 16kHz. METERS A/B: Monitors INPUT LEVEL and GAIN REDUCTION of either Channel A or Channel B.